Tamiya's kit, when compared to Hasegawa's 109s, seems - well, sparse. There are a grand total of three sprues, including the clear parts. The parts seem a little more - durable, heavier, it's hard to quantify exactly. The plastic seems thicker, and the panel lines aren't as petite as Hasegawa's. 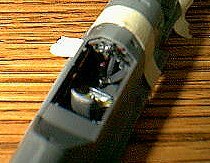 The cockpit detail leaves a little to be desired (not by much) when compared to Hasegawa's offering, but is acceptable. Three versions are offered, with all the appropriate parts. First is an E-4 variant from JG2 flown by Helmut Wick. 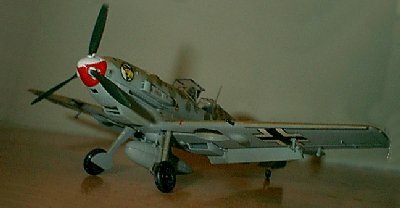 This has a "standard" Luftwaffe camoflage, with yellow nose and a very small, tight mottle along the side. The second variant is an E-7 (distinguished by a "closed" spinner, lacking the cannon port) from 7./JG26. Last is the variant that I was interested in, the E-7/Trop. This is fitted with a tropical filter on the side, and a sand yellow camoflage with green mottle along the top and sides. Pictures of 109E's with this pattern show how well they blended in to the desert background, and have held my interest in this scheme for well over a decade. The cockpit, as I said, leaves a little to be desired. The sidewall detail falls squarely between Monogram's "classic" 109, with vague shapes, and Hasegawa's fine moldings. They do provide an oxygen bottle and trim wheel, but levers and equipment on the sides are shallow boxes. If you've built German WWII aircraft before, the rudder pedals, at first, look completely wrong - and where the cannon breech usually goes, there's a pillar going from somewhere behind the instrument panel to the floor. This is actually right for this variant. Seatbelts are provided as a decal (which I cut out to give it some thickness, then glued into place.) The instrument panel looks fine, and the cockpit as a whole fits in well when assembled. If you're building this for yourself, it's fine. If you want to go for more accuracy, or are trying to get into a contest, I'd say find a resin replacement cockpit. My fuselage was ever so slightly warped - not enough to cause real problems, just enough to require masking tape to hold it together (which I use anyway.) The cockpit fit in perfectly. The wing assembly - 3 major parts - is not difficult at all. The chin oil cooler comes as four parts, and fits seamlessly under the nose. The engine is shown as a "shape" under the cowl - remember to prepaint this black, dark grey, or something "engine-y," but remember it won't be very visible. As mentioned, I was going to paint this as a tropical (N. African) Messerschmidt. This is an easy, but time consuming, paint scheme. For the most part, the aircraft underside and sides are light blue, with sand wing and upper fuselage. This went on easily, using Model Master Acryl paints. (No masking needed to be done, as the airbrushed demarcation line was very soft.) On top of this, however, was the dark green "mottle" on the wing and fuselage. I could have done this with an airbrush, but decided to do so by hand instead. Using Acryl's green and a soft brush, I applied a soft mottle - it's somewhat translucent in spots, which works for me. Just go (gently) in sweeping or circular motions, and it goes on easily. This part took at least fourty five minutes. Once all that was dry, the wheel wells were painted with Gunze Sangyo RLM-02 Grey, the landing gear was attached, and set aside to dry. Tamiya's decals do not react well to MicroSol or AeroSol II. They seem wholly unaffected by them, except for the occasional "bubble." They're also quite thick, so you lose some of the detail underneath. If anyone knows of a solvent that works with these, let me know, otherwise I can only suggest finding an aftermarket decal sheet. Other than that, they went on well. I finished up with light "exhaust" staining, using ground pastels. All in all, I'm happy with the kit. 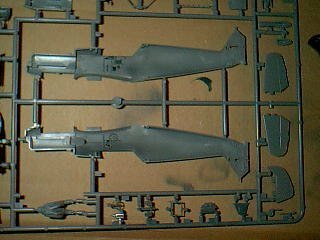 Like I said, it's a bit behind Hasegawa as far as detail, but equal with ease of assembly. I finished mine in about a day and a half to two days. It's an easy weekend project.